I am really excited about today's guest blogger, author Joe Wallace, for quite a few reasons. First of all, I loved his novel DIAMOND RUBY -- you can read my raving review here. Secondly, I love tweeting with him. He is just the nicest man! And last, but certainly not least, I get to meet him this Sunday at my favorite bookstore Aaron's Books! I can hardly wait!!! So without further ado, I'd like to welcome Joe Wallace to Booking Mama! I love being a writer—I’ve never wanted to be anything else—but for most of my career I’ve written nonfiction, books about science, exploration, and baseball. For all of these, I’ve met and interviewed people who were smart, funny, and filled with great stories. They’ve provided windows to exciting, unexpected worlds. Researching and writing Diamond Ruby, my first novel, was something else again. In many ways, it was the most thrilling and satisfying experience of my life. But it was also a deeply solitary one. Learning about the world of the novel—New York City during the Roaring Twenties—meant countless hours in the microfilm room at the New York Public library, immersing myself in that time and place by reading day by day through more than half a dozen newspapers. And then the writing of the book, of course, was also a solitary pursuit. Not lonely, exactly: I felt like I was living inside the colorful, dangerous world of the novel. But regardless of how all-consuming that was, it was no substitute for living in the real world, surrounded by the people I had to turn my back on for hours every day as I wrote. Now that Diamond Ruby is out at last, all I can say is: Thank goodness for readers! As I expected, people who have read the novel are full of questions: Did the great influenza epidemic of 1918 really spread across New York City the way I describe? Did Babe Ruth and Jack Dempsey (characters in the novel) really behave that way? Did the Ku Klux Klan actually infiltrate the Brooklyn Police Department, and were there really running gun battles off Jones Beach between Prohibition agents and rum-runners? Regardless of what you choose to ask, never forget that I welcome the questions. Most simply, I’ll love hearing the sound of your voice. Even such a simple pleasure as that can be a real treat when you’re a novelist. It’s like oxygen, so essential that you forget you need it until you’re deprived of it for a while. Getting to do what we love, we writers are as lucky as anyone on earth. Speaking for myself, though, if I didn’t get to interact with readers, none of the work would be worth it. A book is only complete when it’s been read and discussed. And I’m only complete when I can alternate the world of my imagination with the world of human contact and communication. What a fabulous guest post from Joe Wallace! I have a feeling that Joe would make a terrific addition to your next book club, so you should really consider picking DIAMOND RUBY! And now on to the giveaway! 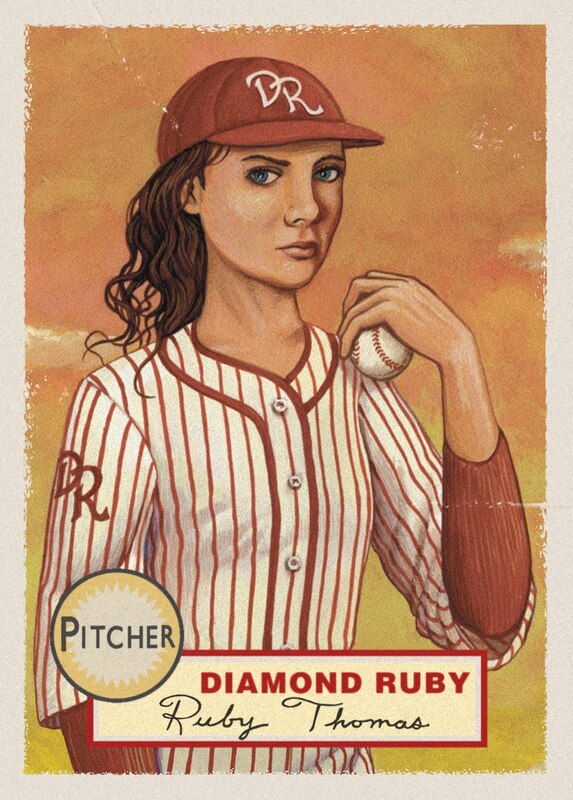 I have one copy of DIAMOND RUBY along with a Ruby cap and a baseball card to share with one lucky reader. Can I just tell you how jealous I am of these prizes? To enter, just leave a comment (with a way to contact you) telling me why you want to read this book. To double your chances, you can leave a question for Mr. Wallace about his novel -- he will be thrilled! This giveaway will be open until Monday, June 21st at 11:59 p.m. ET, and I will notify the winner the following day. This contest is open to those of you with U.S. and Canada mailing addresses only. Good luck! I want to read Diamond Ruby because it would be interesting to learn about the Roaring Twenties :) *Thanks* for the giveaway! I'd like to know what Mr. Wallace plans on writing about next. Will it be there be a sequel to Diamond Ruby? Oh please enter me! I've been so jealous of those of you who have already gotten a chance to read the novel. What's not to love? Historical details, baseball, great characters. My question: Were some parts of New York hit harder by the 1918 flu than others? I'm guessing the families living in tenements were most affected, but I'd like to know. Cheryl--Thanks! Yes, I'm working on a sequel, set in 1926 (three years after Diamond Ruby) and in Hollywood...it's fun for me to follow Ruby and her girls as they get older. Sounds wonderful. Would love a chance to read your book. My question is How do you get your ideas for your stories? Hi Beth...great question. Yes, the old, the poor, the undernourished seemed to get hid hardest by the influenza. But it swept through rich and poor neighborhoods alike...there were countless stories of the families of the wealthy and powerful being struck. I am always very interested to read new books that have some kind of historical information. Sounds great! I'd love a copy of Diamond Ruby. I've been a baseball fan since I was in second grade and chased Willie Mays down the tunnel in Candlestick Park to get his autograph. My question for Joe: you said you've written nonfiction about baseball, but how did you decide to write about a teenage girl in the 20s? Thanks, everyone! katsrus: My ideas come from everywhere. For example, a winter trip to the Bronx Zoo--the emptiest 200 acres in New York City, and with polar bears!--led me to write a story that was published in the collection Bronx Noir. The idea just came to me, and it worked. Carol: I wrote about Diamond Ruby, a teenage girl in the 1920s, because I was infuriated by the true story of Jackie Mitchell, a teenage girl who in 1931 struck out Babe Ruth and Lou Gehrig in an exhibition game...and was then banned from baseball along with all women. Sounds interesting. There's something about baseball and New York that always gets me. Did you have trouble writing a girls story? I enjoy the era of the Roaring Twenties, and this book sounds very interesting. Having never heard of Diamond Ruby myself, I'd like to know how Mr. Wallace first learned of her. Melanie: I knew I was taking a chance, writing a book from Ruby's point of view. But I loved the character, and hoped that readers would take the leap with me. So far, the novel's most enthusiastic fans have been women and teenage girls...the audience I most hoped would believe and root for Ruby. Linda: The Roaring Twenties was an amazing time to write about--so rich and exciting. Ruby Thomas is fictional, but she was inspired by the real-life Jackie Mitchell. I found a photo of Jackie with Babe Ruth and Lou Gehrig at the Baseball Hall of Fame...and that's where the idea for the novel began! Thanks! traveler: I learned about 1923 (when most of Diamond Ruby is set) by reading day by day through about six different New York newspapers. By the time I was done, I had such a three-dimensional view of that world I felt like I was living inside it! petite: with all its dangers, I think NYC during the Roaring Twenties would have been an amazing time to live. The world felt like it was full of life and possibilities. I've had this on my list of books to read ever since I saw your review of it...I want to read it because I usually agree with your reviews! :)Please enter me! Does DIAMOND RUBY have an audio version? It would be a good one to listen to on our vacation. No need to enter me, guys. I'm dropping in to say thanks to Julie for the e-mail. I've posted about this at Win a Book. Come on by and check us out, Joe! I would like to read this novel because I love baseball!! Mr. Wallace, when did you develop your love for baseball? Susan--Thank you so much for posting the link! There will be an unabridged audiobook version of Diamond Ruby out in November. Thanks, Karen! I have so many favorite authors...one whose books I've loved recently is Kate Atkinson (Case Histories, When Will There Be Good News?). And, yes, I like books with strong young heroines in them, like To Kill a Mockingbird and A Tree Grows in Brooklyn! Right now I'm working on a follow-up to Diamond Ruby, set in Hollywood in 1926. Love getting to visit with the characters again. Thanks for the giveaway. The time period of this novel is interesting, and the inclusion of the baseball history makes it even more so. I'd like to ask the author if he ever bases his characters on friends or family. Margie--Both Ruby and her two nieces have elements in their personalities that came from my own daughter, my niece, and some of my students. The language, the attitudes, the strength are universal...couldn't have written my characters without them! i want to read diamond ruby because i love 20th century history and my fiance loves baseball, so i'm hoping this is one title we can read together! Please enter me! I love baseball and historical fiction, so I'm in! allygotts567 at hotmail dot com. Hi Jolee--The only books I know of about Jackie Mitchell, Diamond Ruby's inspiration, are picture books for children. There are also a few short biographies online, but nothing big. Her story isn't well known! Wow, What a great guest post! I can't wait to read Diamond Ruby after enjoying just the writing for the guest post! I'd love to win a copy of Diamond Ruby because I love baseball and I love women heroine's. And Diamond Ruby sounds like the perfect girl to hold my attention! I want to read this because I enjoy historical fiction! Question for Mr. Wallace - My grandmother lost both parents and an older brother in the flu epidemic. In reading about how many people were affected I'm shocked we never learned of this in school. Have you found many readers were unfamiliar with the scope of the epidemic? What drew you to using it in your book? Adriane--So sorry to hear about your grandmother's terrible experience! In answer to your thoughtful question--yes, I was shocked at how little I knew about the epidemic before I started researching it. I'd heard about unimaginable numbers of deaths, but the personal toll on families has been almost forgotten...except in families like yours. I decided that I had to include the flu epidemic in Diamond Ruby partly because so many people in the 1920s had lost family members in the 1918 epidemic. I couldn't write a book set in 1923 without the shadow of that tragedy playing a part. You've all been asking terrific questions that really make me think. If any of you are in book clubs and want the chance to keep talking about Diamond Ruby, I'll be happy to "visit" via webcam (Skype) or over the telephone. I had my first Skype book club visit last week--I'm in NY, and it was in Pennsylvania--and it was a blast. Thanks for listening! I would love to read this! Combine reading with my favorite sport and I am sold! I would love to read Diamond Ruby because I love baseball and I love reading historicals. What made you decide to write about baseball in Roaring 20s? Are you an avid baseball fan now? If so what is your favorite team. When I lived in California I had season seats with the Angels for 25 years! Love the sport and I have to read your book! I would like to read this book because I think it would be a good and interesting read. Please enter me. Thanks! I want to win Diamond Ruby because I'm fascinated by the book's storyline. Please enter me in this giveaway! From where did you originally learn of the true story on which Diamond Ruby is based? Cindy--I decided to write about the Roaring Twenties in New York because it made for such an exciting setting. I mean, Prohibition agents and rum-runners and the brand-new Coney Island Boardwalk and Yankee Stadium, Babe Ruth and Jack Dempsey and a dozen newspapers vying for attention. What a place to put a 17-year-old girl who could throw hard! Sarah--I was searching through photos at the Baseball Hall of Fame for a nonfiction book when I came upon a photo of Jackie Mitchell with Babe Ruth and Lou Gehrig. That's where Diamond Ruby was born. My first love is nonfiction, and I am intriqued that Mr Wallace has ventured into fiction. I am quite sure that it will read more like nonfiction because he has done so much research and pulls from real life events. The premise of he story really draws me in as well. And the title: quite compelling for any woman! Seriously, I played baseball too, so I would really like to win a copy and read Diamond Ruby. With Diamond Ruby being so popular, I hope there will be several more fictional books following. Maybe a series? We all love series....and visiting with the characters again and again. Good luck, hope to be reading more fictional books of yours. I've read nothing but positive reviews of DIAMOND RUBY; please enter my name in the giveaway. And a question for Joe - did you leave any signed copies at Aaron's Books? If I don't win the draw, I'll buy a copy from them! I love books that incorporate a bit of history, even more when some of that history is true as Mr. Wallace has confirmed for us! Sounds like a great book! Terrymac--Thanks! Yes, I loved the world Ruby lived in--and writing about Ruby and her nieces--so much that I'm already working on a sequel...and even a couple of other mystery projects about her. I hope to keep writing about Diamond Ruby for quite a while. Dawn--I definitely left some signed copies at Aaron's...I assume they still have some left! "Diamond Ruby" sounds like a fantastic example of American historic "everyday" fiction - the literary segment brought to life by the masters like Jack London and O'Henry. Having read the classics, I would love to see Joe Wallace's spin on that particular style. wow. I can imagine how the KKK could infiltrate the Brooklyn PD but I wonder how far reaching it was? There are definitely crooked law enforcement officials out there as much as people would like to think there aren't. For everyone else...a special one-time offer: If you buy Diamond Ruby, and let me know at my email address, josephwallace@josephwallace.com, I will send you a Ruby baseball card AND a bookplate signed to you or anyone you choose.